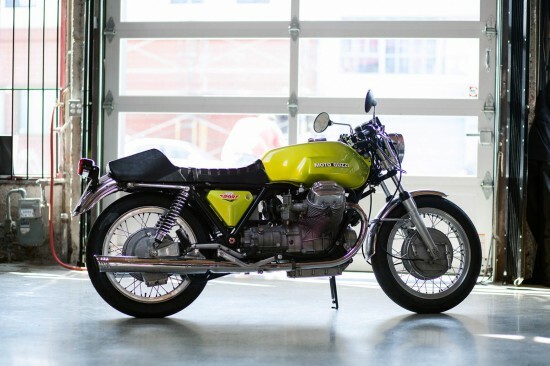 Moto Guzzi’s V7 Sport was the company’s first v-twin sportbike. Earlier racing efforts used the old “loop-frame” as their foundation, but it was clear something better was needed. Engineer Lino Tonti designed a new frame that allowed the longitudinally-mounted twin to sit very low for good handling and stability, with the side benefit of looking lean and purposeful. 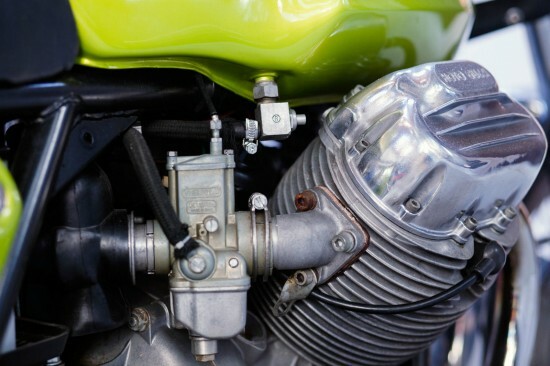 Servicing the engine is a snap, with the heads sticking out in the breeze and relatively easy access to the timing components. And the Tonti frame features detachable lower frame rails to make major service relatively straightforward. Café racers and specials featuring this frame and powertrain may have become cliché, but there’s a good reason for that, and I still want one, although I still plan to just build mine from a less expensive starting point. Overall, the bike is in very good condition and runs very well. The engine has a little over 140psi compression in both cylinders and doesn’t leak anywhere. The transmission shifts nicely (for a Guzzi!) and is a five speed, with the old right hand shift, one up, four down shift pattern. 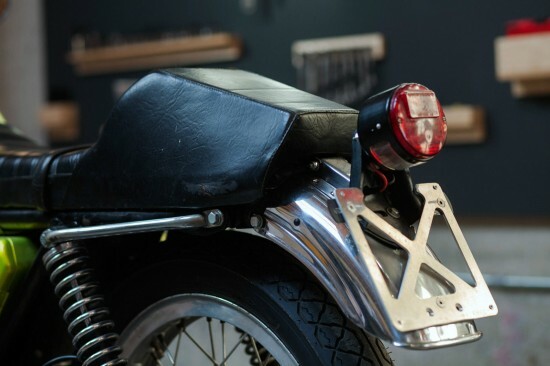 All the electrics work fine including, lights, horn, turn signals, brake lights, etc. Paint is in very good to excellent condition. Both tool boxes use the same key and lock correctly and securely. The frame does have a few scratches here and there, but overall, the paint on it is in nice condition. Front and rear stainless fenders are in very nice condition (no dents or dings that I noticed). Chrome is very nice for a bike of this age, but it is not perfect (again, it’s Italian and wasn’t perfect to begin with) and shows some “patina” in some areas (see pics as I’ve tried to show where). The mufflers are original “shark gill” Silentium’s (they are NOT repops). They are in very good to excellent condition with no flaking or pitting on either side. Price is $21,800 with one offer so far. It has some minor chips and scratches, but the bike still looks terrific and just suggests that the bike has been used as intended. 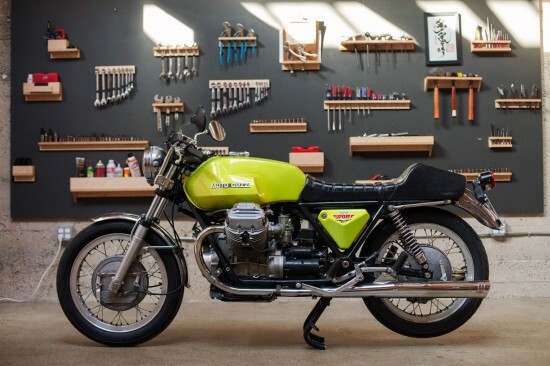 Guzzi’s sportbikes make great classics: they handle well, have good brakes, heritage and racing history, and you can ride the hell out of them. While $22,000 isn’t exactly chump change, it seems like a small price to pay for something this beautiful and this timelessly classic. A bike you can show off, and use to go places. The tribute bikes and clones are a dime-a-dozen, but there’s nothing like the real thing. I put 100 miles on my Sport on Sunday. It is exactly what a motorcycle should be. True, the “real thing” does have a certain cache that fakes don’t. 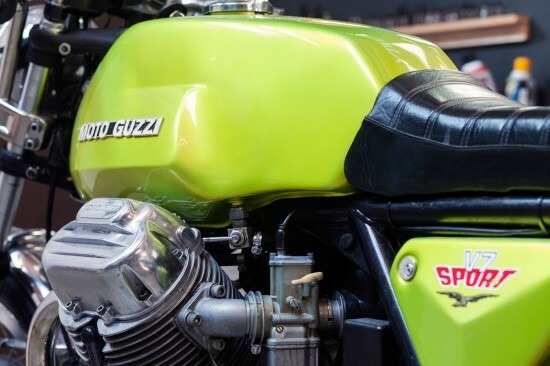 Unfortunately, I don’t happen to have $20k lying around so I can buy the real thing, or the even bigger sum I’d need for an original Laverda SFC, which I’d expect is the main reason people build tributes and replicas in the first place. Considering how many are running around, it seems that’s a pretty common problem. However, I might be able to scrounge up the money to buy a pretty nice T3 and build something that gives me 90% of the look, sound, and feel of the original for 25% of the cost. Fakes should always be acknowledged as such for honesty’s sake, but unless we’re talking about an original “Telaio Rosso” V7 Sport, I’d expect a well-built tribute probably won’t feel very different from the real thing. Having owned neither, I couldn’t say for sure. I agree that from a practical standpoint, a Tonti frame is a Tonti frame. Another point is that there are only 150 or so disc brake Sports in existance. If you want the practical benefits of the disc front end and don’t want to spend years hunting one down, an 850T or other donor makes a good starting point. Aaron, I agree with you completely: there’s something cool about owning “the real thing” that you’ll never get from a replica, a sense of history. And obviously there’s a huge difference in terms of resale value. But if a replica gives me the look, sound, and feel of the real thing and I can ride it without feeling like I’m burning up a valuable artifact, something I should be carefully preserving for posterity, then I’ll probably be pretty happy! Shhhhh! Don’t TELL EVERYONE! Actually saw a couple nice racing LMIII’s at a vintage racing event in South Jersey last summer. If I ever get something written up about the event with the photos I took, I’ll send you a link.